Just as you would never medicate your children without knowing whether or not they actually have an infection,you need to be able to diagnose nutrient deficiencies in your vineyards. How to do it? Soil and petiole testing can provide a clear picture of what is going on in your vineyard. The soil tests will determine what nutrients are available to be taken up by the vines’ roots, and the petiole tests will show whether or not the roots are actually absorbing those nutrients. Once you have the soil tests, you have one side of the story, and petiole tests will give you the other side of the vine nutrient story. A soil test can indicate that the soil pH, K, Mg, and N levels are all adequate, but if the vines are still puny, something else might be at work. This is where a petiole test comes in handy. Most likely, however, puny vines could be due to too much or too little water in the vineyard, and a large crop size will also affect overall vine size. In reference to growers traditionally applying 100+ lbs. actual N/acre, one grower recently commented, “At $600 and up per ton, there is no such thing as tradition.” He’s got a good point. Instead of applying 100lbs actual N to every nook and cranny of your vineyard, just because it’s what you (or your dad or grandpa or great-grandpa) always have done, take the time to get a soil test to determine whether you really need that much N everywhere. Nitrogen availability depends on organic matter in the soil, and each percent organic matter in the soil account for about 20 lbs. actual nitrogen/acre. Hans Walter-Peterson at the Finger Lakes Grape Program developed a worksheet to calculate nitrogen needs based on soil tests results. I recommend you take the time to assess your individual blocks to determine nitrogen needs through soil and petiole testing. You may be surprised by what you may (or may not) need. Select an area containing at least 30-50 vines of the variety to be sampled if possible. These 30 vines should be representative of: (a) a problem area, or (b) the average of the vineyard. The final fertilizer suggestions will apply ONLY to the area represented by the selected vines. Select 30-50 Vines to represent the sample. If more than one area or block is being sampled, give each area a REFERENCE NUMBER and record this number for future reference. If you have the fields identified with either a number or a letter, this may be used for the reference number. When the diagnosis sheet is returned, it will refer to this field number/name. Be sure to maintain thorough records of your sampling dates, techniques, and locations. Maintaining proper records will enable you to observe patterns over time and to treat specific areas in a timely and efficient manner. Remember: Soil analysis in addition to petiole testing will provide the most accurate picture of what’s going on in your vineyards. A soil or petiole test alone will not necessarily indicate whether a vine requires a specific nutrient or if the soil requires a change in the pH. Time Of Collection. Collect petiole samples at bloom or 70 – 100 days after bloom (late August or early September). Samples should not be taken after harvest. Materials Needed: A 2 or 3 brown paper lunch bag. At BLOOM select a leaf opposite a cluster. At 70-100 days AFTER BLOOM, select the youngest mature leaf on a shoot bearing a cluster. Leaves should be well exposed to light and free from injury and disease. The petiole is the slender stem that attaches the leaf blade to the shoot. Remove and discard the leaf blade and keep only the petiole. The 60-100 petioles constitute the sample. Place all 60-100 petioles in the paper bag and mark the identification number on the bag. Collect no more than 2 leaves from each vine. Be sure to collect petioles throughout the vineyard to obtain a representative sample of the block. Wash The Petioles before they wilt to remove spray residue and dust. This may be done by dipping the petioles in a weak detergent solution (a couple of drops of Tide, etc., in 2-3 cups water) and then rinse quickly and thoroughly with clean water. Do not allow the petioles to remain in the detergent or rinse water for more than one minute. Blot the petioles dry on a paper towel or clean dish towel then place them loosely in the bag. Allow the petioles to dry at room temperature until they become crisp, or for a faster drying time, place bags in oven at 200°F for 30 minutes. *Sampling techniques may vary slightly, depending on where they are submitted, so be sure to follow the proper instructions. This set of methods is based on the Cornell Nutrient Analysis Laboratory’s (CNAL) protocol. Timing of soil sampling: Although soil sampling can be completed at any time of year, it is best to sample when soil is not too wet or to dry. With a spade, dig a hole about 12 inches deep. Use the trowel to scrape along the side of the hole from about 0 to 8 inches below the surface into a container. Use this same technique for the subsurface sample (8 to 24 inches). Be sure to label separate samples. A soil probe can be used to collect soil from 0-8 inch and 8-24 inch depths, and be sure to keep surface and sub-surface samples separate. Place 1.5 cups dry soil into a labeled plastic bag and fill out forms completely for more accurate recommendations. (For CNAL) Seal the form in the envelope provided and seal the plastic bag with the soil sample in the mail bag. Be sure to keep the mail bag attached to the envelope, which should be filled out properly. Note: For more accurate results in vineyards that are not uniform, select the most uniform blocks from which to sample and combine 5 to 6 samples from within a block, mix them thoroughly, then submit 1.5 cups of that as one sample. For instance, a vineyard with sandy loam soil at one end and more clay at the other, submit two samples for the two blocks within that vineyard. 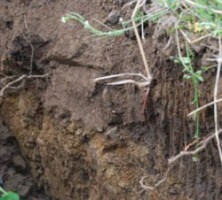 Additionally, to determine your soil type, you can obtain a soil survey map from your county extension office, or you can use the USDA’s Web Soil Survey page (http://websoilsurvey.nrcs.usda.gov/app/) to zone in on your land and determine soil type.